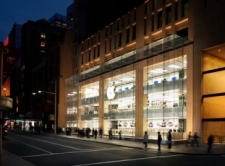 Perched near the King Street Wharf in Sydney, Australia is the first official Apple Store to open in the southern hemisphere. This flagship store on George Street has most of the steel and glass architectural details that are hallmarks of the Apple stores around the world, and even includes the spiral glass staircase and Apple logo across the storefront. Comprised of three floors, the glass and stone building is in a very popular neighbourhood of Sydney. The store is located at the corner of George and King Streets and situated among premier shopping districts and tourist destinations. The exterior of the building is clean and representative of both modern yet classic Australian architecture and incorporates the look shared by most of the Apple stores across the world. No cost was to be spared for the materials of the building so the sparkling glass was imported from Germany, while the stone was brought in from Italy. The interior walls are brushed stainless steel from Japan, and the wooden tables within are from the United States. As the 215th Apple Store to open globally it is difficult to imagine that the George Street store in Sydney was also the first Apple store in the southern hemisphere. While two other stores in Australia soon opened afterwards, the George Street location holds the historical distinction of being #1 south of the equator. Of the three floors of the store, the first two are dedicated to products and sales, while the 3rd floor is home to one of the largest Genius Bars in any store. The size, layout, and location of the George Street store also allow it to host music shows for artists and groups such as Chris Isaak and Boy and Bear. The store is a popular location for acts to release or celebrate their iTunes hits, complete with performances and after-parties. The King Street Wharf area surrounding George Street is popular both for locals and tourists alike due to its extensive variety of internationally inspired restaurants such as Bungalow 8, La Cita, The Malaya, and Wharf Teppanyaki. The area is also home to a long list of arts and cultural events throughout the year. Visitors to the George Street Apple Store will find a combination of recent history, modern conveniences, and entertainment all mixed throughout the different sections of the neighbourhood. George Street itself is regarded by many experts as one of the premier shopping districts in the world due to its boutiques, quaint shops, high-end fashion retailers, wine bars, bakeries, cafes, and much more. Notable neighbours to the George Street Store include Louis Vuitton, Top Shop, Peter Alexander, and the famous Queen Victoria building. Within this famous Australian building is the Strand Arcade, which opened on April 1, 1892, and which still houses a classic arcade and several shopping venues. The neighbourhood was originally established in the 1800s and the layout of the streets and the architecture reflects this. The closest train station is located in Wynyard, which is several blocks away from the store. Those wanting to drive to the George Street Store can use the Western Distributor Freeway which has exits just a few blocks from the Apple store. Tourist transportation is not yet directly connected to the location, but a major transportation renovation project is underway and estimated to be completed in 2019. This will bring a tram line from Circular Quay to Randwick and on to Kingsford.